This series of posts is attempting to answer some of the questions surrounding the appropriate Canadian response to the recently announced US plan to create an expanded United States Space Force. Past, present and future Liberal Prime Ministers in 1968. Pierre Trudeau, John Turner, Lester Pearson and Jean Chretian overlooked by the press and the image of Sir Wilfred Laurier. Photo c/o Wikipedia. In part one, titled "The Axworthy Doctrine," we attempted to answer some of those questions by showing how the dissolution of the Soviet Union in the early 1990's led to a Canadian reassessment of the four traditional pillars of our national defense strategy and a new focus on international peacekeeping. This new policy required space focused communication and surveillance capabilities and led directly to our first military space policy in 1998. Part two, titled "The Changing Political Landscape" discussed why Canada never had a military space policy prior to 1998 by going back to the 1960's and the federal liberal party under Lester Pearson and Pierre Trudeau. Here is part three of this series. 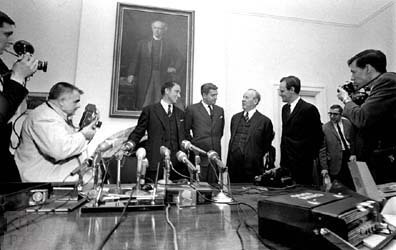 Canadian Prime Ministers Pearson and Trudeau essentially refused to differentiate between space based military assets for communication/ surveillance and space "weaponization" (placing weapons in space) in order to be perceived of as strong, international supporters of the United Nations Comprehensive Nuclear Test Ban Treaty (1963) and the UN Outer Space Treaty (1967). This led to the shutting down of most Canadian military space programs and a focus on space science, exploration and technologies with civilian applications that could be spun off into profitable companies. Beginning in 1993, under Prime Minister Jean Chrétien, the government moved to slowly address this situation by putting into place a series of military restructurings which culminated in the creation of the Directorate of Space Development (DSpaceD) in 1997. Over the next two decades and much like any aggressive and growing bureaucracy, the Canadian government slowly acquired a series of assets to enable DSpaceD to perform a useful function. The various RADARSAT programs, with their dual military/civilian use (culminating in RADARSAT Constellation, expected to be launched sometime in the spring of 2019) and the DND Sapphire space surveillance satellite, launched in 2013 to provide data to the United States Space Surveillance Network (SSN) are current examples of useful Canadian space policy tools. But those contributions were essentially used as keys to access larger US space surveillance and Earth imaging technology such as the SSN. Canada had no real intention of building a stand alone system mostly because it didn't have the money. The Chrétien government spent its time in office focused on gaining control of a Federal deficit which had ballooned under both Liberal Prime Minister Pierre Trudeau and Conservative Prime Minister Brian Mulroney. As part of his program, Chrétietn tended to want to contribute to this program and not spend enough extra government money to develop an independent Canadian military space capacity. Overall, the stuff the Canadians needed to borrow from the Americans in order to maintain their operational military capacity, simply ended up reminding the Americans that Canada was no longer capable of contributing it's "fair share" to defense without substantial assistance. It's a state of affairs which has lasted ever since. Canada has no overarching national space policy, and space is not addressed in either of the latest national security and defence policies. Space is so structurally buried and fragmented within government that voices advocating for more appropriate treatment of space security issues are marginalized, even within such departments as Industry Canada (now Innovation, Science and Economic Development Canada, the Canadian Space Agency's parent department) and the Department of National Defence (DND). The Canadian Space Agency’s (CSA) budget, and accordingly, its interests and activities have been diminishing and narrowing around space science and exploration for the last decade (dominated by human space flight and international space station programs), leaving little investment opportunity for other space pursuits (i.e., space-based services and access to space). The DND, while pursuing the development of a small space-surveillance satellite (Project Sapphire), has progressively scaled back its space interests and pursuits since its mid-1990s peak. Even then, those interests and pursuits were modest, end-user focused, and highly reliant on American leadership and resources. Fortunately for the military space advocates, by 2008 the liberals were no longer in power and the newly elected Conservative Stephen Harper government was busy developing what they called the Canada First - Defense Strategy. Officially focused around increased funding (from $18Bln CDN in 2007-2008 to over $30Bln CDN in 2027-2028) and new equipment purchases for what is supposed to be variety of domestic and international missions, the new policy had a practical focus on protecting Canadian claims of arctic sovereignty. Why would Canada be doing this? ... is in dispute with its neighbour, the US, over the ownership of the northwest passage. If sea-ice continues to shrink, this passage could knock a third off the trip from Europe to Asia. Currently, the shortest route involves crossing through the Panama Canal. Harper's determination to show that Canada will not be booted out of the Arctic is such that he has decided to put $2.9Bln US ($3.8Bln CDN) towards building up his nation's military presence in the area. This will help buy eight new ice-breaker military patrol ships and build a new port in the north of Canada. According to the article, our long-term allies had suddenly become our major competitors, at least in the high arctic. If the Federal government really wanted new military purchases, expanded operations and increased infrastructure they would also require expanded communications and area surveillance capabilities of the type most effectively provided by space based assets. Only this time, the Canadian government was supposed to have actually purchased those assets and not just borrowed them from patient allies. We didn't and the consequences of that decision will be discussed in our next post. Portions of this multipart overview were originally published in the January 03, 2011 post, "Canada's Military Space Policy: Part 3, The Changing Political Landscape." Towards Northern Sovereignty." Last episode: "The Changing Political Landscape," as part two of "A Short History of Canada's Military Space Policy and How it Fits into the Current US Space Force Discussions," begins. Next episode: "Funding an Appropriate Force," as part four of "A Short History of Canada's Military Space Policy and How it Fits into the Current US Space Force Discussions," continues.